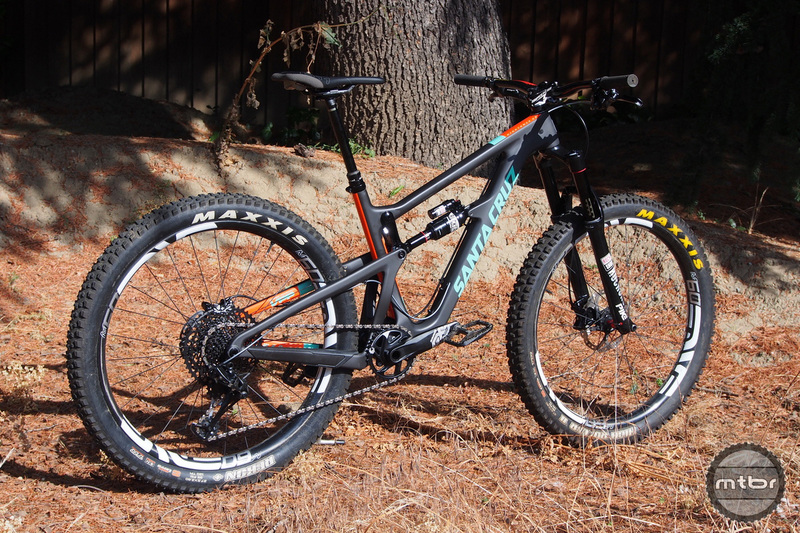 Mtbr’s been testing the new SRAM GX Eagle group on this Santa Cruz Hightower. 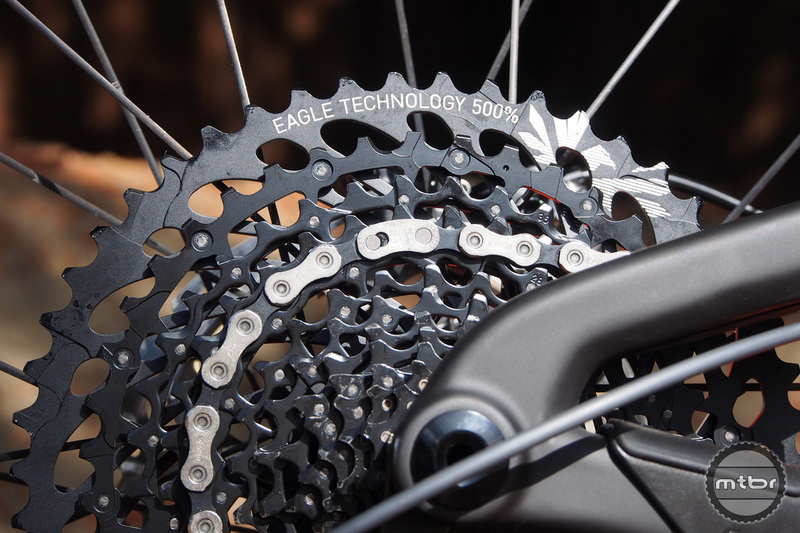 SRAM Eagle 1×12 was introduced last year amidst much anticipation (and some skepticism). But the near unanimous feedback from everyone who’s tried it has been a resounding thumbs up, aside from some complaints about the price. That issue has now been addressed with the release of the lower price point GX group. A decade ago, nobody would have ever thought they needed a rear cassette with a 10-50t range. But use the drivetrain and the mountain bike experience is absolutely improved in so many aspects. The only issue holding back riders was that price ($1417 for the XX1 Eagle group or $1193 for the more enduro-oriented X01 Eagle group). And more significantly, the cassette which is a wear item that needs to be replaced semi-regularly and costs $420 for XX1 and $360 for X01. 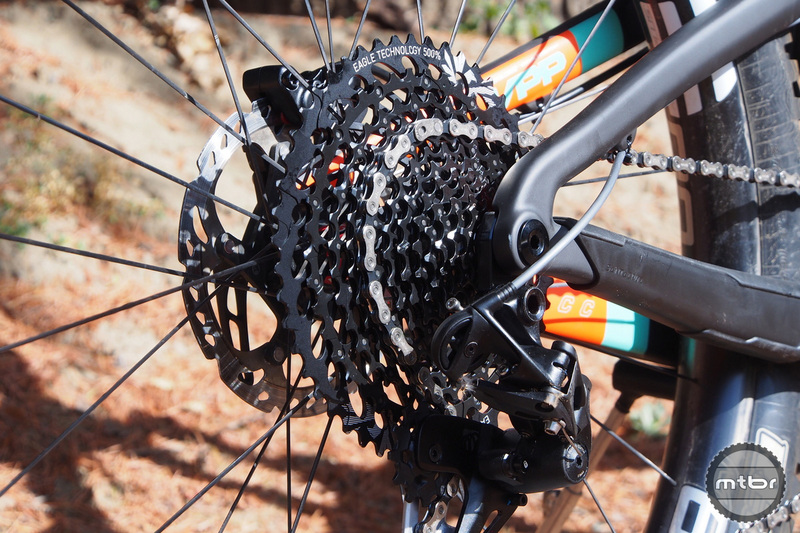 Read the Mtbr review of SRAM’s original Eagle group. The new SRAM GX Eagle group is here. 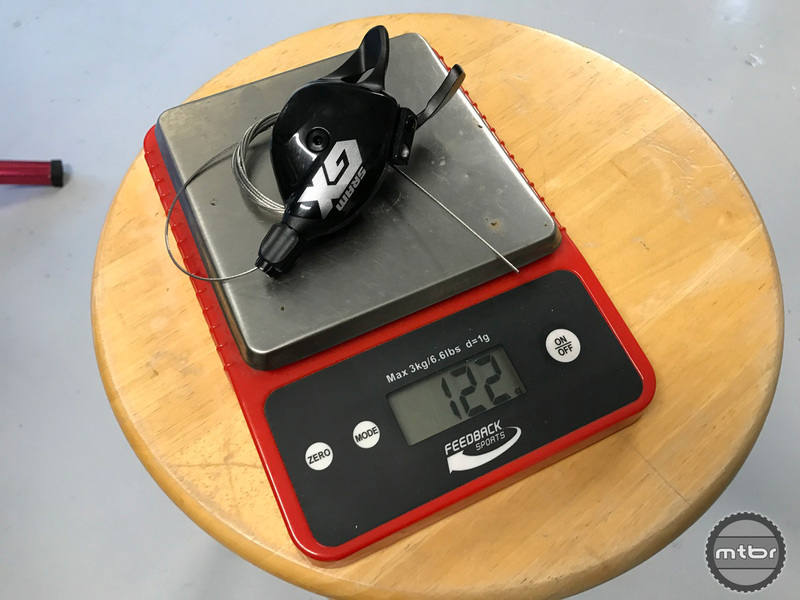 Actual weight is 447 grams for the GX Eagle 10-50t cassette. So it is 215 grams (or 0.47 pounds) heavier than X01. 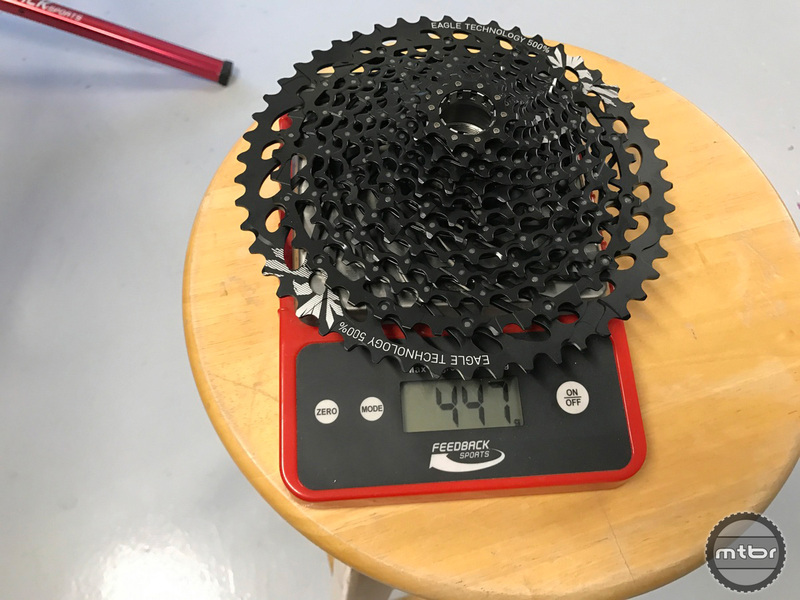 Quite significant is the cassette at 455 grams which may seem heavy but it is very respectable for a cassette with 12 cogs with the largest at 50t. 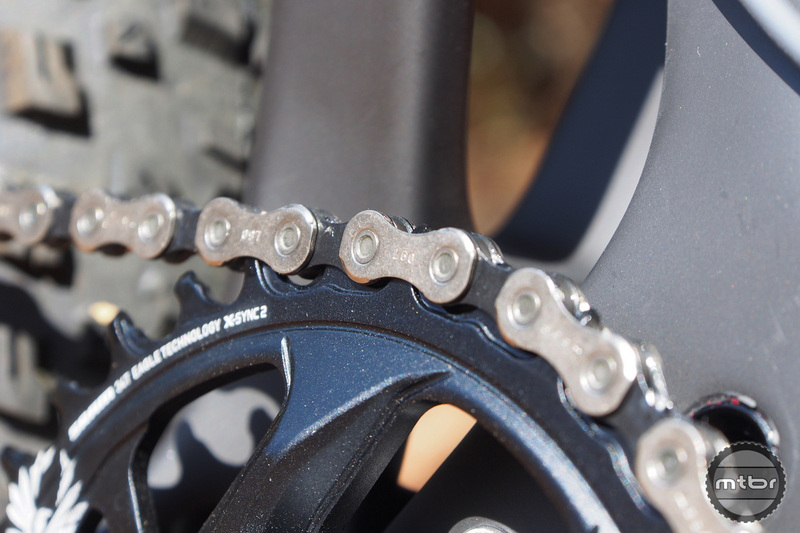 For comparison, the 11-speed Shimano XT 11-46 weighs 439 grams. 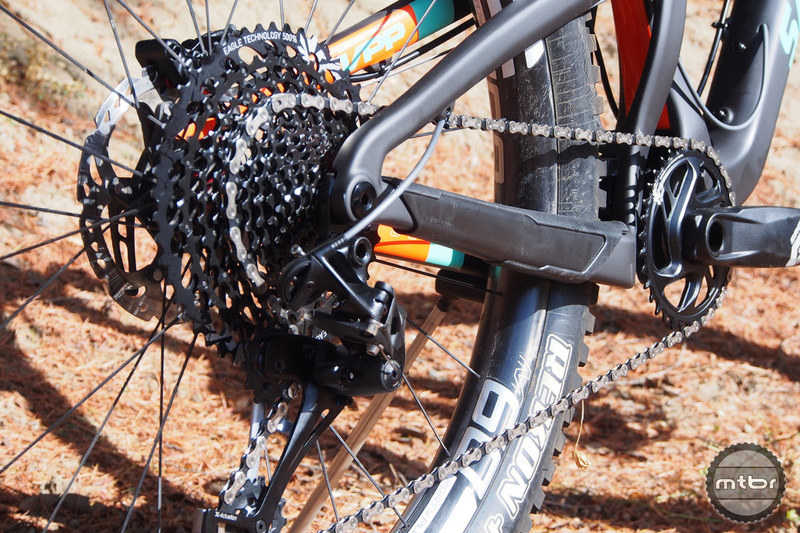 The new cassette and its companion PowerLink-equipped chain. Mtbr took delivery of the new SRAM GX Eagle group three weeks prior to release, so we’ve had a few rides on it already. Craftsmanship is first rate and it installed without any quirks or difficulties. 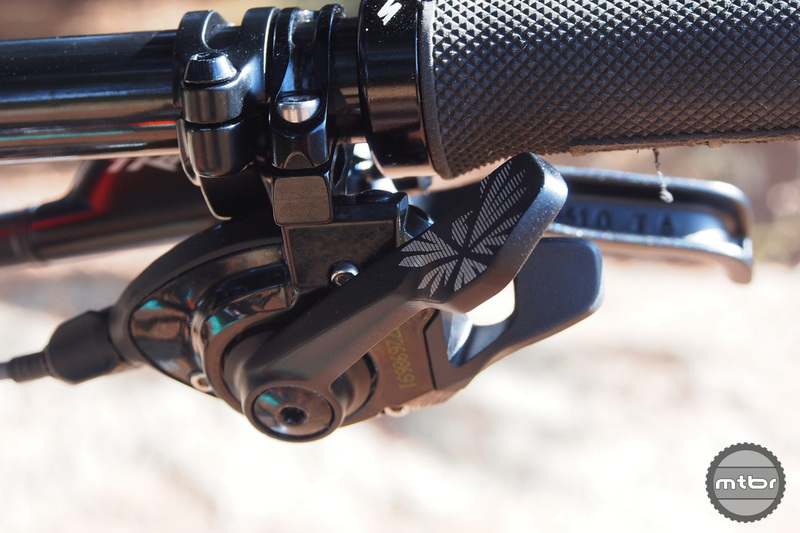 There is no detectable play in the shifter or cassette. Shifting performance is the key, and to our delight, GX Eagle performs just like X01 (and even XX1). Shifting fires consistently and predictably. Getting on to the 50t ring is no problem at all and feels no different than moving around the rest of the gears. Even when shifting quickly under load, we never got the chain to hang up. The prediction here is that this group will perform just like the GX 1×11 group since construction is very similar. And most users of that system report that its performance and durability is on par with X01. 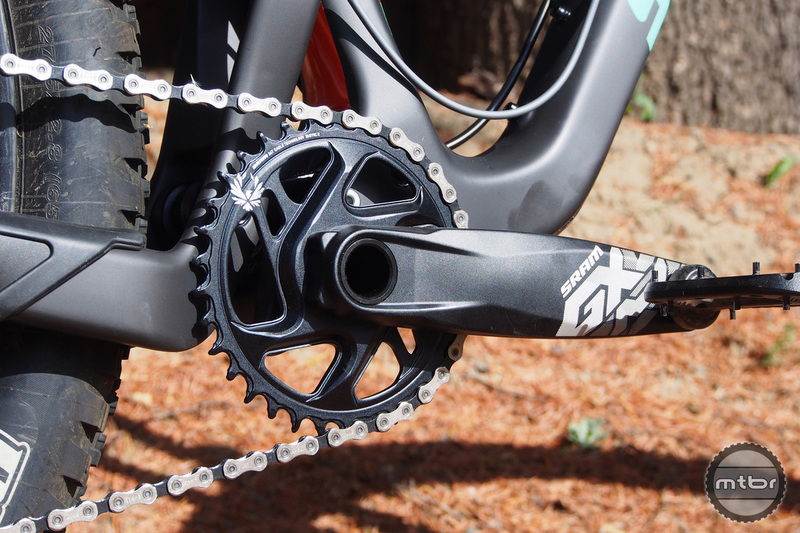 The SRAM GX Eagle crank. The rear derailleur weighs 291 grams. The front shifter weighs 122 grams. The 10-50t cassette is bigger than the rotor. Chain weight is 261 grams. Crank with Eagle front ring. 10-50t cassette is bigger than the rotor. 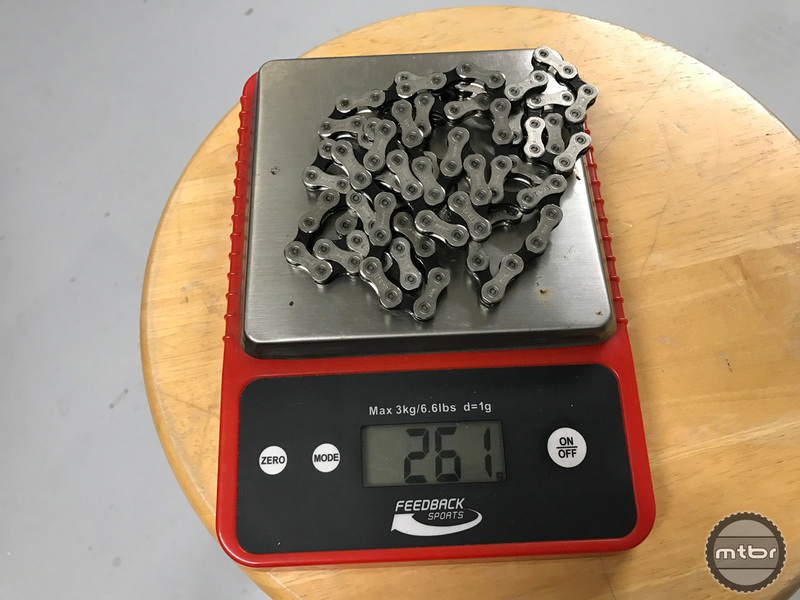 447 grams actual weight for our 10-50t cassette. 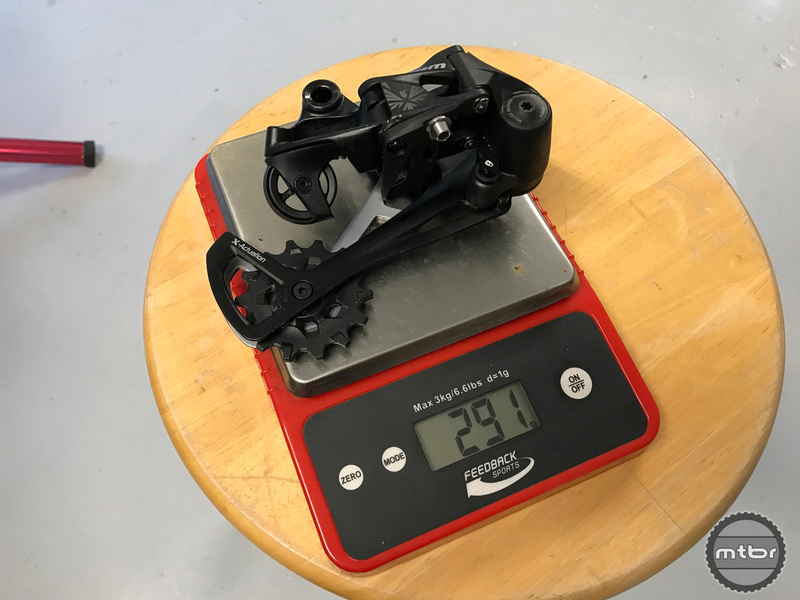 291 grams for the rear derailleur. 122 grams for the front shifter. 261 grams for the chain. 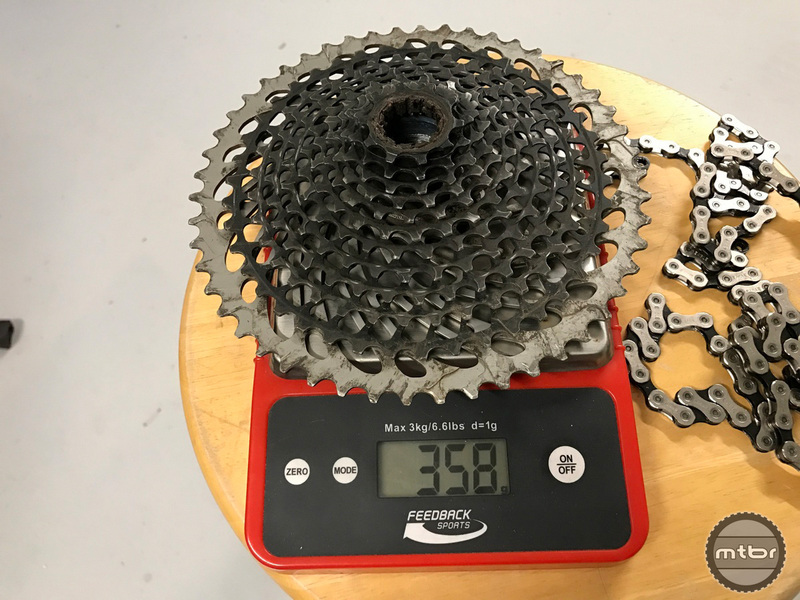 X01 Eagle cassette is 358 grams for comparison. 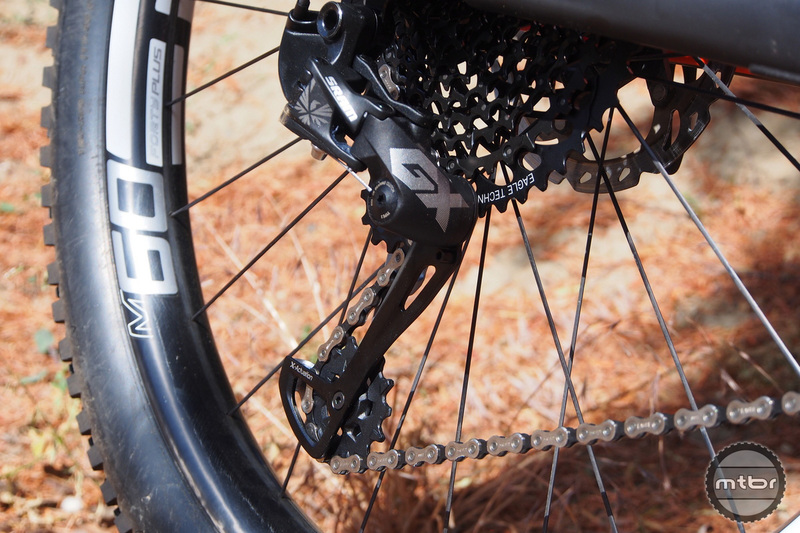 Can you back pedal in the 50 tooth cog without having the chain drop to a smaller tooth? This has been prevalent with the 11 speeds. On my 2 current Eagle setups, you can backpedal without the chain dropping. This was not true on the for the 11 speed setups I had. Thank you SRAM for making this stuff affordable! $195 cassette affordable? More than a crankset. To be replaced every year. Who are you kidding? And a pound of rotating, unsprung weight at the rear wheel. I can see no issue here./s But I guess this is the price of being hip and keeping up with trends. CVT is coming next year to a bike near you. Hey thanks for geoblocking and reaming aussie customers SRAM. Not buying until you stop this madness. ever notice how there’s never any photos from the unbiased coverage of great side bulge with All of sram’s horizontal parallelogram derailleurs? My prayers have been answered! Finally, an affordable, “working mans” wide-range 1×12 drivetrain! Front derailleurs are now museum pieces. The next time I need to buy a new cassette for my current bike, I’m going to switch to 1×12. And I want my next new bike to have this drivetrain. Hmm 1×12 with 500% gear range. So gear for steep uphills and you under geared for long fast downhills, gear for downhills and you over geared for steep uphills. Great for the century and multi day events. For long events with 25%+ hills, is 1* anything a backward step from, for e.g. my Di2 2×11 750% gear range. (9*44 cassette 22*34 rings). But horses for courses (and riders).